A new levy in the African Union could lead to more financial independence—but who is funding human rights? A contribution to the openGlobalRights debate on funding for human rights. Français. Many scholars and critics have commented on the African Union’s (AU) financial dependence on external partners. As Oyoo Sungu said: “The AU has the bark of a bulldog, and the bite of a poodle. This is because it’s yet to become independent financially—and ultimately, politically.” Who really owns the AU agenda and, more importantly, its human rights institutions, such as the African Commission on Human and Peoples’ Rights (ACHPR), the African Court on Human and Peoples’ Rights (AfCHPR), and the African Committee of Experts on the Rights and Welfare of the Child (ACERWC)? While human rights institutions receive operational money from the AU, they receive very little funding for their programs. For example, for the 2016 budget for the AfCHPR, the operating budget was financed by Member States while the program budget was 100% funded by donor partners. c) Member States would fund the Peace support the operations budget at 25%. The dependence on external partners—and the failure of states to pay their dues—only reinforces the image of the AU as a weak institution. Also, the July 2016 Heads of State and Government Summit gave practical decisions on the way forward. They took note of Dr. Donald Kaberuka’s report (former President of the African Development Bank [AfDB]) and appointed him as High Representative for the AU Peace Fund, which is meant to fund mediation and preventive diplomacy, institutional capacity and peace support operations. They also entrusted H.E. Paul Kagame, President of the Republic of Rwanda, to prepare a report on the institutional reform of the AU. The report, among other things, reminded African Member States that only 25 out of 54 of them had paid their assessment for the financial year 2016 in full. 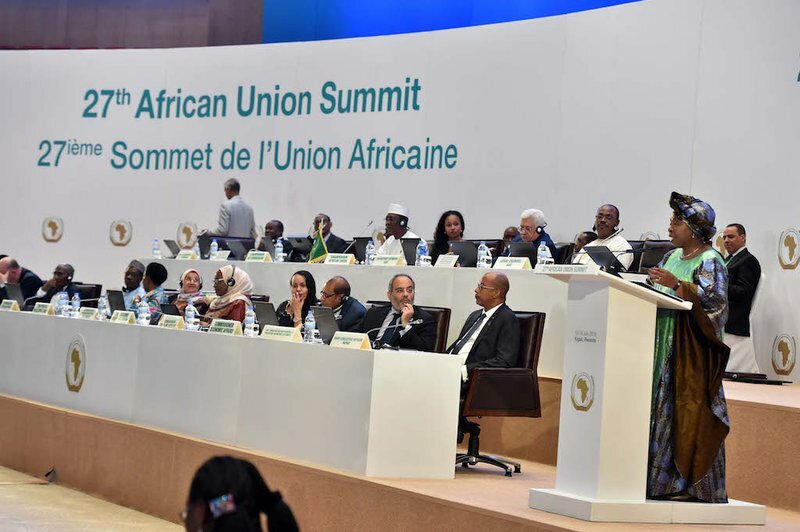 The dependence on external partners—and the failure of states to pay their dues—only reinforces the image of the AU as a weak institution that doesn’t set its own programmatic agenda. Among other things, Kagame’s report recommends that the current scale of assessment for Member States should be revised based on other criteria such as the ability to pay, solidarity, and equitable burden sharing. But most importantly, he proposed that the penalties for Member States for failure to fulfill their contribution obligations should be revised and tightened. It is not surprising, then, to see Rwanda leading the implementation of the new 0.2% levy on imported goods to finance the Union. In February 2017, Members of the Rwandan Parliament approved a Bill, which, if enacted into law, will help the Rwandan Government to raise Rwf 1.5 billion per year to sponsor AU affairs. If the other 54 African Member State do the same, the potential for self-funding is significant. Nonetheless, it is still not completely clear where this 0.2% levy fund will be attributed. The 2016 Guidelines explain that the 0.2% will be instituted to finance the 100% Operational budget of the AU, the 75% Program budget, 25% of Peace Support Operations (PSOs) and the Peace Fund. Yet human rights institutions are completely left out of the picture. Although 75% of programs will be covered by the levy, nothing is mentioned about the ACHPR, the AfCHPR or the ACERWC. The explanation instead highlights the need of funds for political or social emergencies such as Ebola, climate change and migration issues. While those are highly important topics and need specific responses from African Member States, the continental human rights institutions also need to be reinforced. During the July 2016 Summit, the leaders declared the next ten years as “the Human and Peoples’ Rights Decade in Africa”. Three AU human rights institutions are developing the African Human Rights Action and Implementation Plan 2017-26. Most importantly, during the July 2016 Summit, the leaders declared the next ten years as “the Human and Peoples’ Rights Decade in Africa”. The three key AU human rights institutions, along with the Pan African Lawyers’ Union (PALU), are in the process of developing the African Human Rights Action and Implementation Plan 2017-26. But the question remains, where will the money come from to develop this Action Plan, and how can we be sure that enough funds will be dedicated to its implementation? Having the programmatic budget of human rights institutions funded by external partners leads to a crippling lack of flexibility in the AU. The donor-led situation makes it difficult for the AU to own and decide which kind of programs/areas should be prioritized or not, leading to the crucial question of priorities for Africa. While peace and security on the continent is a prerequisite to economic growth and social development, and to the right of African citizens to leave in peace and dignity, we often forget that human rights violations are usually the first step in a chain of events that end up in violence and conflict. Therefore, promoting and protecting human and peoples’ rights is the first step in ensuring democracy, governance and peace and security. Human rights violations can come from different corners, such as corruption, illicit financial flows, trafficking, and money laundering. Investing in human rights is investing in the general economic and social growth of the continent. For example, Africa owns 12% of global oil reserves, 8% of global natural gas, approximately 30% of global mineral reserves and 600 million hectares of uncultivated arable land, which is 60% of the global total. But the continent has weak international negotiating power with external partners and more importantly, weak protection of rights of Africans when being forcibly evicted from lands. Human rights are part of a much bigger picture, and the current situation makes Africa grow at a slower pace than it should be. Although Africa has the most comprehensively developed human rights framework in the world, covering the rights of humans in general but also defining peoples, women, disabled and children’s rights, African Member States are making very little effort to ratify the relevant AU legal instruments and in contributing to the development of human rights on the continent. Words are being spoken but actions are missing. The AU needs to put more focus and funds into financing its human rights institutions, creating both credibility and results.